Heading into the second day of the 20th NTRA National Horseplayers Championship (NHC) Presented by Racetrack Television Network, STATS Race Lens™ and Treasure Island Las Vegas, J. Randy Gallo was confident he could look around the room and be certain of two things. Whether or not Gallo believes himself to be among handicapping elite, the Florida native put on a performance Saturday that puts him in position to lay claim to the most illustrious of titles among horseplayers. After being blanked for much of the first day of action and the early portion of Day 2 of the NHC, Gallo had a string of longshots deliver to give him an unofficial mythical bankroll of $279.80 and move him into second overall behind leader Robert Gilbert heading into the final day of the tournament that will crown the Horseplayer of the Year. Gilbert, a 68-year-old former high school teacher and military veteran, had a mythical bankroll of $198.20 after Day 1 – the second highest score since the NHC went to an 18-race per day format in 2016. He continued to add to that margin on Saturday, finishing with a total of $289, bolstered by scores in the third race at Tampa Bay Downs, the third race at Santa Anita, and the eleventh race at Tampa Bay Downs. 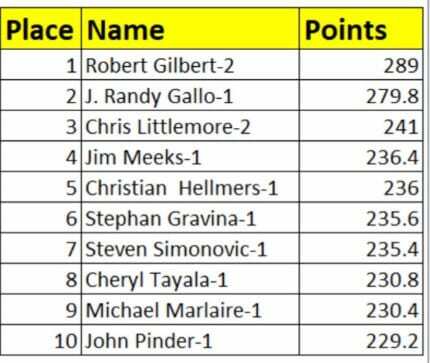 He will have stout company as the three-day event marches toward the Final Table on Sunday, however, thanks to a late surge from Gallo and the looming presence of defending NHC champion Chris Littlemore, who sits third overall with a total of $241. Gallo, who is competing in the NHC for the fifth time, posted his best finish in 2000 when he ended up 48th. He hasn't cracked the top 100 since and said he was 0-for-36 with his bets during the first two days a year ago. On Saturday, he pulled himself out of the doldrums by hitting longshots in the eighth at Gulfstream and the eleventh at Tampa Bay Downs. His final four plays of the day put him over the top as they all yielded double-digit returns, including 38-1 shot Raphael in the ninth at Oaklawn. “Last year, I was out here at 4 a.m. in the morning doing all the work and….I didn't even have a place in 36 bets,” Gallo said. “It was just like, the magic happens. I was doing nothing today and then all of the sudden I got horses knocked down. It seemed like everything I wrote down late came in. Gallo earned a bankroll of $228.20 on Saturday alone, the highest total of any of the NHC competitors on the day. As the Day 2 leader, Gallo earned a Breeders' Cup Betting Challenge entry. No horseplayer has ever won the NHC title more than once, but defending champion Littlemore stands as the biggest threat yet to add a second Eclipse Award trophy to his case. Littlemore was 18th after the first day of action and continued to build on that momentum to put himself in the top three. Littlemore knows a thing or two about the mental stamina it takes to prevail over a field of more than 650 horseplayers. To that end, he was planning to give himself a break Saturday night, choosing to check out a Golden Knights game before resuming his handicapping Sunday morning. Jim Meeks ($236.40) is fourth with Christian Hellmers ($236) fifth. Stephan Gravina is sixth with a total of $235.60 and Steven Simonovic seventh with $235.40. “I called my daughter and she told me to keep trying so that's what I did. I did a lot better today,” Tayala said. “I saw (longshots) were happening around me and I was missing some so then I just decided to take a shot. I look at the breeding and the body language and that worked out. Luck was with me today. Michael Marlaire ($230.40) is ninth and John Pinder, who qualified for the NHC for the first time this year, is tenth with $229.20. Full unofficial results can be viewed online at NTRA.com. NHC entrants were required to place 18 mythical $2 Win and Place wagers – eight on mandatory races that everyone played and 10 on any of the other races from eight designated racetracks across the country. The same was true for Friday and those Day 1 bankrolls rolled over to today. Sunday's Semifinal will consist of 10 optional plays from 33 eligible races. Bankrolls will then carry over to the Final Table, made up of seven mandatory races. This entry was posted in Horseplayers, NL List and tagged chris littlemore, horseplayer of the year, national horseplayers championship, NHC, NTRA, Randy Gallo, robert gilbert by NTRA. Bookmark the permalink.